Degel Hatorah chief says his party won't recommend Benny Gantz for PM - even if that means haredi faction will be left out of next gov't. 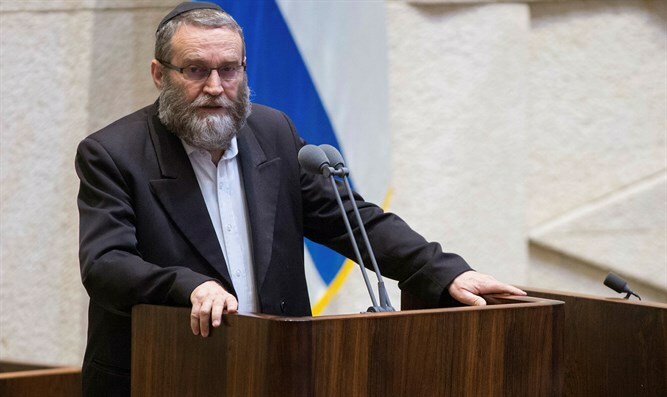 MK Moshe Gafni (United Torah Judaism) says UTJ will not recommend Benny Gantz as prime minister even at the price of sitting in the opposition. "We're a party with honor and we sometimes sit in the opposition and don't shy from it," Gafni said during a panel discussion on the Ramat Gan Diamond Exchange. "Lapid was a finance minister who didn't understand anything about the Israeli economy and left no mark, Lapid hit haredi society and our children's education," Gafni said. Asked if he was not afraid of an indictment against Netanyahu, Gafni said, "The leftist parties and all the others tried to oust Netanyahu and do everything according to that. If there's a suspicion that a minister's done something improper, he should resign, but a prime minister not, because that means replacement of the entire government."